I hope you’re all recovered from the Rolex 24, folks, because this weekend we’re kicking right back into gear for Australia’s great Bathurst 12 Hour, another one of the world’s most incredible endurance races. And if you thought you saw your fair share of safety cars at rain-drenched Daytona, let us take a moment to remember that our Australian counterparts have been sending out safety cars for even wilder reasons. Such as, y’know, horses. I think this is probably my new favorite video. 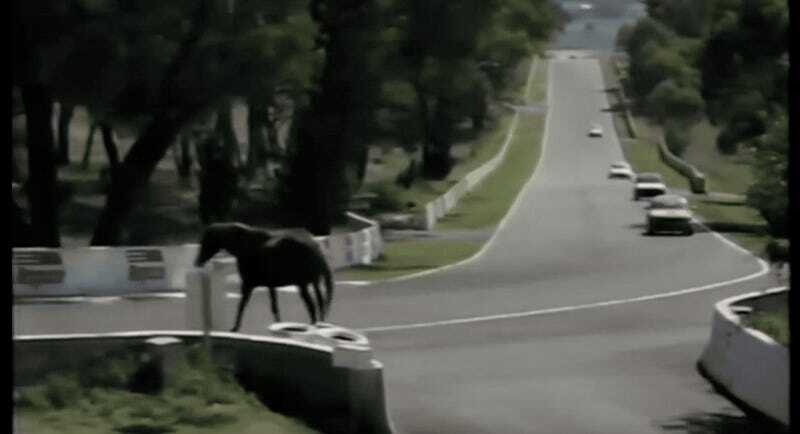 I’ve seen safety cars thrown for raccoons, dogs, and foxes, but a whole entire horse is something entirely new. I can’t say I blame the fella, though—I’d want to get as good a view of those neat Australian cars as I could get. Please insert the horsepower joke of your choosing into the comments.